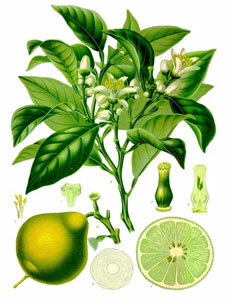 Bergamot essential oil is widely used as a fragrance component in perfumes, soap and other toiletries. It is probably most known in the food industry as the flavouring agent used in Earl Grey tea. Common Extraction Method: Cold pressed from the fruit peel. Plant Origin: Italy, Asia and the Mediterranean. Physical Description: Light greenish yellow to a brownish green colour with a thin consistency. Aromatic Description: Fresh, sweet-citrus with spicy, floral notes. Properties & Benefits: Has anti-depressant, anti-septic, anti-spasmodic, deodorizing and astringent properties. Is reported to help alleviate anxiety, depression, stress, fatigue and relieve skin irritations like eczema, psoriasis, acne, insect bites, wounds, ulcers and herpes. Is considered uplifting, rejuvenating, and balancing. Blends well with: Black pepper, chamomile, clary sage, coriander, cypress, frankincense, geranium, helichrysum, jasmine, juniper, lavender, lemon, mandarin, melissa, neroli, nutmeg, orange, rosemary, sandalwood, vetiver, violet, ylang ylang. Cautions: May cause photo-sensitivity in those with delicate skin. Use 'bergaptene-free' oil for skin applications. Do not use during pregnancy.